Over Memorial Day weekend, my fiancé and I took a road trip up to the mid-coast of Maine to get away from the hustle and bustle of city life for a few days. The drive on I-95 and I-295 is the typical highway scenery – cars, trees, and concrete. Once we reached route 1 near Brunswick and Bath, the road slimmed and nature was far more abundant. At a few points we drove over bodies of water, and with the windows down, we could smell the sea. Our first stop upon arrival in Rockland was Claws: Rockland’s Lobster Eatery. 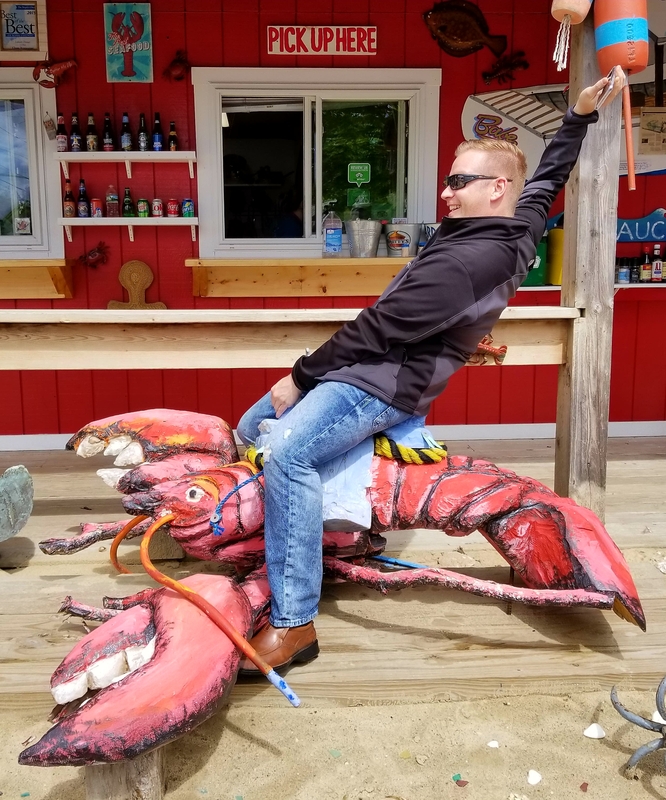 Plenty of photo opps were had here – below, T demonstrates his master lobster riding skills. After filling our bellies, we headed a couple of miles down the road to check into the Rockland Harbor Hotel. And then it was time for an afternoon nap. We spent two nights in the area and enjoyed all that Rockland and Camden had to offer, from fine dining to outdoor excursions. In hindsight, an extra layer of clothing would have been wise – temperatures dipped below 40 both evenings and the wind bit through our spring jackets as we visited lighthouses. There was so much more we wanted to explore on this trip, yet time didn’t permit for it all. We did manage to visit much of Rockport and Camden, made possible by less crowds this early into the high season. Now to make a list of what we missed for the next time we come up!